How can one comment on a work of art based on an experience of no more than 10 minutes with it, when the entirety lasts an entire day? Well, the elevator pitch for Gordon’s film tells you enough. This is the Alfred Hitchcock thriller Psycho (1960) slowed down from 24 frames a second to just two. It runs in slow mo, in silence, in glacial indifference to the fate of Marion Crane or Janet Leigh. So Gordon’s film is somewhat more sadistic than the original. I caught up with it as Crane drives along Highway 99, nervously looking ahead, nervously checking the rear view, in a seeming loop. We know she is speeding to her death, but she does so with minimal, staccato movements that let us study the appearance and behaviour of an archetype: the victim marked out by fate for a grisly end. But she is herself a criminal, and so perhaps the film also does her a service, stretching the period of time between her theft of a client’s money and her demise at the hand of Norman Bates. 24 Hour Psycho is both generous and cruel. It torments the viewer with its impossible duration and at the same time promises us saturation with one of the most analysed movies of all time. “It takes work, pious effort, to see what you are looking at,” so writes Don Delillo, whose 2010 novel Point Omega opens with a character who visits and revisits this piece, when it is at MoMA. If encountered in the cinema, movies take very little pious effort. 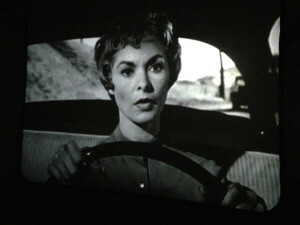 But Hitchcock manipulates his own creation to an even greater extent than this black and white monolith of video art. IMDb is a goldmine where Psycho is concerned and we learn that the director used a 50mm lens to give his footage a voyeuristic immediacy. The 45 second shower scene uses 78 pieces of film. So much has been written about Psycho and so much has been written about 24 Hour Psycho. But perhaps that is the ultimate comment from this slow procession of scenes. It is a kind of autopsy. 24 Hour Psycho can be seen in The Indivisible Present at Modern Art Oxford until at least March 22 and perhaps beyond, depending on how the year-long Kaleidoscope programme pans out.